upon rats, weasels, opossums and skunks, animals known to destroy pheasant nests and eat the eggs. 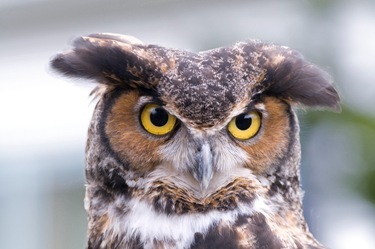 Since Great Horned Owls are one of the only predators of the skunk (which has the second highest incidence of rabies among native wildlife in Pennsylvania) it seems the Great Horned Owl may be quite beneficial to both Pheasant and Man. Many factors must be considered in connection with Pheasant population decline. Destruction of suitable habitat is a major factor as farming practices change and housing increasingly replaces farmland. Pesticides, disease, starvation and road kills must also be weighed. Great Horned Owls are magnificent creatures deserving of our awe and respect. If you have never seen a live owl close up, invite our center to come give a talk for your school, club or group, and learn more about these majestic raptors.